We'll talk about it, and up. JUST GOOD CLEAN FUN...Cream of the crop, crème de la crème, best of the best: Jacki Manna! This family show expert is an award winning (Most Likely to Not Move Her Lips) Ventriloquist, Magician, Face Painter, and Balloon Twister. Why Jacki? First, she is a teacher and knows children, so your CHILDREN'S PARTY is a guaranteed, hassle free, smash hit! Next, she is the perfect host for VACATION BIBLE SCHOOL because she's traveled on 4 continents as a children's evangelist. And finally, she has performed at lots and lots and lots of, you get the idea, places like the Royal Caribbean Cruises, WDW, Universal Hard Rock, and even at her grandson's birthday party! call, text, yell, holler! Manna was a BIG hit! Jacki was our guest speaker at our annual ladies brunch in March, 2017 which included those sixteen and older. Jacki was engaging , fun, and the message delivered was thought provoking. She presented Jesus throughout her presentation and everyone loved her cast of zany characters who drove home some key points at just the right time. The ladies loved it!! Thanks Jacki for using your gifts to tell others about Jesus, reinforce their walk and bring laughter into their lives. Jacki was good enough to do a children's program the night before the brunch. The kids had a blast and Jacki made sure they knew who Jesus is and his gift of salvation. She taught them a simple way to tell others about Jesus and gave each one a tool they could use to demonstrate the gospel with their friends and others. They really listened to what she was saying as she wove the gospel into what she was talking about and had them captivated with her sidekick and a few magic tricks all the while making sure they knew the good news so they could tell others. Thanks Jacki for sharing your gift with us. Jacki Manna was invited for our church VBS and we are so glad she was part of it! The kids absolutely loved her. Her ventroquilism and her face painting skills were amazing! She interacted and involved the kids throughout the show. The gospel and memory verses were broken down to an easy level so that even the youngest ones could understand . The kids still talk about how much fun they had with her show. Jacki is truly talented and passionate .She was such a sweet person to be around and such a blessing.May God bless her and use her more! Jacki Manna was so awesome with all the kids that came to the christian summer camp that we held. She shared the Gospel to the little kids in a very effective way through her puppet shows and her fun, interactive activities. She broke down hard concepts of the Bible in an easy and understandable way and taught the children with enthusiasm and care. Anyone could easily see the passion that shines through her and you can tell she enjoys what she does. Every child loved her and even asked about her after the summer camp ended. Children still spoke about her lessons and puppet shows and grasped everything that Jacki taught so well. We were truly blessed to have Jacki as our host for our event. Her face paintings were also so cute and creative. Everybody loved it. She is truly talented and loving, a wonderful person be around with. My daughter has requested Jacki Manna 2 years in a row. The entertainment, laughter and Magic Show are just amazing. Both the children and the adults were all entertained. You are a wonderful family and it was so much fun seeing your daughter laugh so much! Thank you for inviting me. Jacki works magic with balloons as well. There is something about kids with painted faces and balloons that just never gets old. It’s always such a blast with kids! They loved the face paint and the balloons! I can’t thank Jackie enough, nor recommend her highly enough! Jackie walked into our anxious group and set the wheels in motion for an amazing weekend. Our little guests were all 5 or under, so we felt she would have her hands full, but almost immediately the children were captivated by the magic, the puppetry and the magnetism of Jackie! They could not stop talking about the show and did not want her to leave!!! 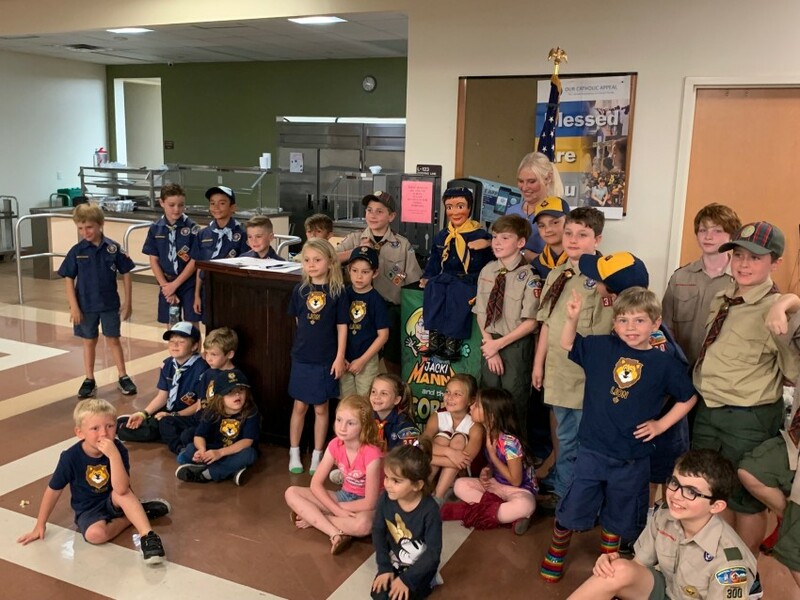 Jackie came to us at a VRBO home and managed to occupy the children as she set up for an amazing show....such a memorable way to welcome our guests and make memories with the children! Jackie was able to incorporate children’s activities (that captivated our adult guests as well), weave in my birthday and kick off a magical weekend, flawlessly! Our guests all began thinking of future events with Jackie Manna! Thank you, Jackie!!! We can’t wait until next time! Awww, what a wonderful, blessed family you are!! I only wanted the best for you all, and wanted this birthday to be incredibly memorable! Thank you for the opportunity. At the beginning of this month, our association held its annual Crepes party to celebrate the Chandeleur. More than fifty people attended, including sixteen children (mostly teenagers.) Everybody enjoyed very much the evening, not only by making and eating crepes, but also because Jacki Manna offered a great show. Jacki is a remarkable magician and ventriloquist. Both adults and children enjoyed enormously the two parts of her show. This show is really appropriate for this kind of event. Such a wonderful group of people at this fantastic cultural experience! The Alliance Française of Greater Orlando is truly the best place for enhancing your knowledge about France, French culture and its language. Merci infiniment! We attended Jackie's second entertainment event at a friends birthday party and both the times it was awesome. We highly recommend hiring her. Thank you so much for being there! All the children had so much fun! Jacki was a total hit at our school carnival! She was so easy to work with, professional, and made our less-than-ideal set-up work perfectly for her show. Kids and parents were both thoroughly entertained the entire time. I would highly recommend her as an addition to your next party! Ventriloquism is soooo funny - Jacki did such a nice job. Kids were so excited. Time passed by in seconds. Glad to have booked Jacki. Thank you so much. 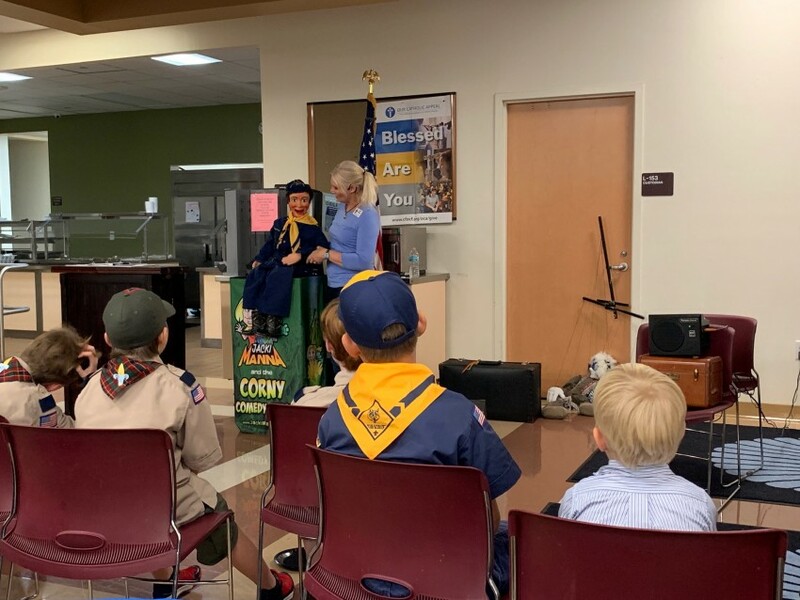 It was an amazing evening honoring all the hard work and dedication by great Cub Scouts and phenomenal leaders! What a privilege and what fun to entertain for you all! Thank you! You are one of my dearest families I've met through my entertainment business, and it was my upmost pleasure to help make your daughter and her friends so happy! Thank you! We can’t say enough about Manna the Great! She is clever and engaging with lots of tricks up her sleeves. Our 9 year old wholeheartedly beleives in her magic! Your son is one of my top favorite youngsters in my career! My family and I hosted a party for my 5 year old niece. We ended up waiting until the last minute to book the entertainment, so we greatly appreciate how Jackie Manna was able to come out on such short notice. Her show was amazing and so hilarious!! She had both kids And the adults laughing. Magic show, ventriloquism, face painting and balloon twisting: all for such an affordable price. Thanks again for everything. It was my pleasure to hear her giggle and feeling so special! You all are an extra special, wonderful family! I am grateful you asked me! Awesome Birthday Party for 6 year old! Jacki had the kids mesmerized and laughing out loud while the adults were just as entertained! She is patient and able to roll with the show when the kids interrupted the ventriloquism. This will definitely be one party to beat as I received lots of compliments! We had an awesome afternoon with Ms. Jacki, big & small kids alike! Thank you for making our son’s birthday so meaningful & full of fun! We are very glad you celebrated with us..thank you very very much from the bottom of our hearts! Wish we could have you in every occasion. N.B. Triple awesome wholesome fun! Highly recommended! I hired Jackie at the last minute to entertain my parents and students in Poinciana. I didn’t exactly know what to expect since I found her via online search. She was amazing and I will definitely hire her again. Totally recommended. She is very nice and the kids loved the show. Amazing! We are so grateful the Lord lead us to Jacki Manna and Company. She gave not only a professional program, it had the reason for the season of Christmas and open opportunity to know Jesus. The message was both gentle and direct and we pray those that were not certain of their salvation will have some thought about the message delivered. She was sincere, fun and entertaining! Jacki gave an awesome performance for the Paullina high school class of 1953 reunion! All were howling with laughter. Our thanks to Jacki for coming out to Flagler County Schools Summer Camp this summer. It was wonderful for the children. They all enjoyed the show and the interaction was awesome. Jackie has been providing Balloon Artistry and Face Painting for our school Spirit Nights at our McDonald's stores. She is always a professional, and always pleases our schools and customers! Jacki Manna was the host for our three day Vacation Bible School. She did an amazing job in keeping around 150 kids entertained throughout the meeting. All the kids loved her. She also conveyed the gospel to the kids using her different puppet characters. In short, she was super fun and entertaining. I would definitely recommend her for all events that involves kids!!!! Jackie has done a surperb job of providing her face painting service at our festivals for several years. She is always in demand. Jacki has been regular part of our Summer Reading program at the Suntree/Viera Public Library for more than 8 years now. She offers a consistently wonderful show full of humour the whole family can enjoy. The main ingredient that makes her show so enjoyable is her inclusion of the audience. They aren't there to just watch the show, they are a part of the show. This is a key ingredient I look for when considering performers for my Summer programs, and Jackie has it in spades. I also like that Jacki teaches the children some of her magic and ventriloquism. Many children can be seen leaving the shows having conversations with hand puppets. It's great fun! Ms. Manna is a consumate professional. Her show mezmerizes the kids snd they become immersed in the fun. She always delivers more than expected. Excellent entertainment for your party. The children were so happy with interacting with Jackie and the green little friend. So complete show with magic, ventriloquist and face painting. The kids loved them! Jacki is an amazing and kind artist! I hired Jacki for an in-store event. Jacki definitly kept the children interested and engaged with her show! Our little customers also enjoyed the balloons she made but I think my staff enjoyed their balloon hats more. Lol! I will definitely keep her in mind for my next event. We are so glad we decided to have Jacki perform in our son’s birthday party — as everyone had a blast. Happiness and laughter filled my son’s birthday party with her puppet Jojo Bean, Monkey Skunky and her magic tricks/jokes! We really enjoy Jackie conducting our staff parties. She has amazing talents, no one is ever disappointed about her skills as a magician, comedian or Ventriloquist!!! Jackie Manna continues to encourage audiences with her passion for Magic and Ventriloquism. She is talented and creative, and her shows continue to inspire those around her. She also offers beautiful face paint, and so much more! A must see for any event. Book Jackie Manna! 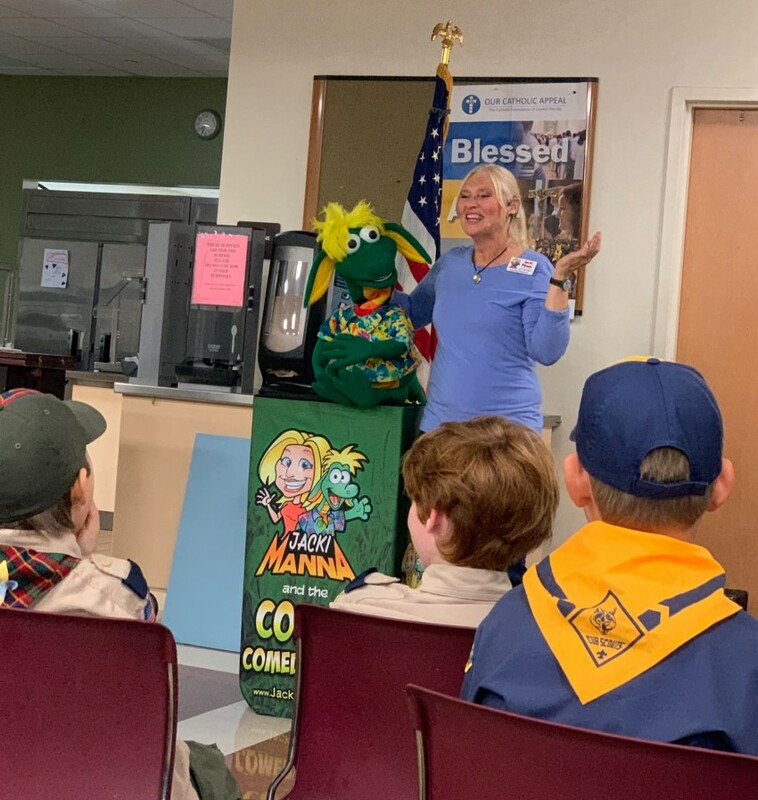 Jacki Manna is a standard bearer in children’s entertainment, never missing an opportunity to provide teachable moments in the arena of character development through her creative characters, shows and a varied menu of artistic offerings. As a seasoned full-time elementary school educator, she knows and understands children. As an entertainment entrepreneur and business woman, she is a consummate professional. Jacki Manna touches the lives of both children and adults with love and a wonderful brand of wit, personality and entertainment. She is super nice!! She completely entertained my guests and is an excellent artist. Everybody was delighted by her magic tricks and ventriloquist skills! Highly recommend!! Jacki provided an outstanding comedy routine for my family and neighbors! Kids and adults alike were enthralled and entertained. My son LOVED the magic white board routine. He laughed so hard he jumped out of his seat! I would highly recommend Jacki Manna, so talented! We've had Jacki Manna do several shows for our family and have loved every one of them. She is great with children and does a fantastic job including us adults as well! The face painting was beautiful and her balloon twisting was a hit! Everyone loved her "Corny Crew". We highly recommend Jacki for your party entertainment needs! She's the BEST!! Funny, Classy, The whole Package! Jacki came out and did a 30-minute act for my wife's baby shower! The crowd was mainly Indian-Americans (from India) which are a group of people that quite generally react like a 4-year old where you wonder if they understood anything you spent the last hour saying until the car ride home when they start repeating everything like someone just hit play! Everyone loved her act! She had the entire room, about 60 people including adults and children, glued to their seats during her act and rolling. For the children, she brought them all up near her and introduced them to 2 characters in that tight window. In my opinion, the reason she was so successful in her act was her preparation and experience. You could just tell that she was not doing this for the first time. We were very blessed to have her come and entertain us. She will definitely be invited back to another event. I don't know Jacki from Eve but when she was doing her act, you could feel the favor of God on her skillset. She is well worth any premium price she requests. Thank you Jacki for coming out and doing your thing for us! Ms Jacki Manna was fantastic! We got the right choice! Ms Jacki Manna was absolutely fantastic. She performed for the birthdays of our sons. All children were very entertained as well as the adult guests. She was so generous giving away a lot of balloons that are twisted and her artistic hands made every kid look so happy and proud of their face painting. She was so friendly and manage to get the attention of the kids in the party and listen to her. We were so surprised as she made a surprise performance having the puppet and magic on her magic board. And of course we are very thankful for that. Ms Jacki made our party a successful one. She 's very professional and so sweet. Even if we had a little hard time regarding the paperworks, she still managed to help me out to make things go as plan. Again, thanks Ms Jacki for having a good job. Maraming Salamat po(thank you) from our whole family! Each year, AFGO (the renowned worldwide organization created in Paris almost 130 years ago) organizes a crêpes (sweet) or galettes (savory) party. Anticipating that a significant number of children (most of them students at our French School) would participate, we asked Jacki Manna, who is also a French teacher, to entertain the crowd. Jacki produced two half-hour shows: a magician and a ventriloquist show. Both were very skillfully executed. Children as well as adults had a blast; and AFGO received a lot of rave for this party, in great part due to Jacki’s performance. Jackie did a GREAT job entertaining my family and friends for my brother's birthday party. The audience was made up of all adults from mid-30s to some over 80s. And everyone enjoyed her show! I highly recommend her for any family get together! Jacki's gig was very entertaining. Her skills as a ventriloquist were amazing and the each puppet had an unique personality that was really brought out by her voice. She used a variety of props during her magic act; each one was a pleasure to witness. I enjoyed her act and would definitely book her again. On our son's 7th birthday party, we had the pleasure of watching Jacki Manna's show. It was so much fun, the children were completely enthralled with her magic, her puppets and her wit. Cowboy Eddie, JoJo Bean and her other puppets friends were a total success with the audience. Jacki has a great way of interacting with the children! The magic was definitely there; one trick after another, the hour long show passed like a minute of pure magic! Thank you for a wonderful birthday experience! So many compliments on Jacki!!!!!!! Jacki did an amazing job at my daughters birthday party. We received many compliments and my husband and I were very pleased we had her there. The children loved her and she was a terrific addition to our party. Thank you Jacki and see you next year.!!!!! I just wanted to say thank you for the fabulous job you did at my daughter's 6th birthday party. You remembered she likes ducks, Hello Kitty, and included her little brother. These details mean so much. You were wonderful! Thank you, again. Jacki Manna will make you laugh for sure! She has kids come on stage and makes things funny for everyone. Jacki's alligator JoJo Bean wore a funny costume and swimming goggles. He tried but couldn't say where he is from - Florida. He was funny. I got to see a drawing on a board talk while someone erased the face. Everyone that comes to her show gets a special prize, a Million Dollars. Kids and adults will like her show a lot! She will make you laugh for sure. Go see Jacki Manna. Jacki is a children's angel! I am so blessed I had the opportunity to meet Jacki. She is indeed a entertainer who aims to please the children and families she serves. Jacki is passionate about her work. I will definitely consult with Jacki again for future upcoming events. My husband and I saw Jackie perform ventriloquism several times, most recently in Madison, WI. She had Cowboy Eddie with her, and they were funny and entertaining! The crowd loved her! She brings her characters to life with wit and charm, and they even sing sometimes! Jacki is multi-talented, professional and a true entertainer! We look forward to seeing her perform again soon! Wonderful and amazing birthday party for my son!! Jacki made my son feel so important and special at his 4th birthday. He talks about her puppet, Jo Jo Bean, all the time. She even made me and the other adults laugh. I highly recommend her for any children's party! Price Range: We'll talk about it, and up. Insurance: $1,000,000 - Fully insured. When you contact me, you can always expect professionalism, friendliness, and efficiency. You get the same when you hire me. I have the good traits of Type A personality, (ambitious, meticulous) along with being bubbly and flirty (in a good clean way). I focus on good relationships. I am fully insured. I know what I'm doing and I'm doing what I know! You can always expect GOOD CLEAN FUN. 1. Jacki is fluent in French. 2. Jacki is the world's best swim teacher (according to her students). 3. Jacki entertained on Royal Caribbean Cruise Line. Her favorite was aboard the world's largest cruise ship, the Oasis of the Seas. 4. Jacki has traveled the world (4 continents) evangelizing Christianity using ventriloquism, magic, face painting, and balloon twisting. 5. Jacki inherited Cowboy Eddie, a puppet carved in 1910 and owned by Howie Olson. They performed at the 36th Annual Vent Haven convention (the only international ventriloquists convention) in 2012, where she paid tribute to Howie Olson. She and Eddie performed at the Houdini Convention in Madison, Wisconsin in 2013, at the Midwest's Premier magic convention AbrCORNdabra in 2014, at Circus World Reunion in 2015, and at the Florida StateMagic Convention Magicpalooza in 2016. 6. Jacki has been a high school, middle school, and now elementary school teacher. Hi there! I am the world famous (for people under 3 feet tall) ventriloquist, Jacki Manna. I hail from the corn capital, Des Moines, Iowa and now live in the entertainment capital, Orlando, Florida. I started in Show Business just because I showed some kindness to an 80 year old man on a cruise ship where I was working. Later he, a true famous ventriloquist Howie Olson who had his own Kids TV show for 40+ years, became my mentor. I needed to feed my kids so I got my puppets and magic and everything he taught me and did show after show after show. I'm still doing show after show after show. And like they say, the rest is history! Also, I am part of a TV show (13 episodes) that is currently airing on 12 stations nationwide and in Canada. 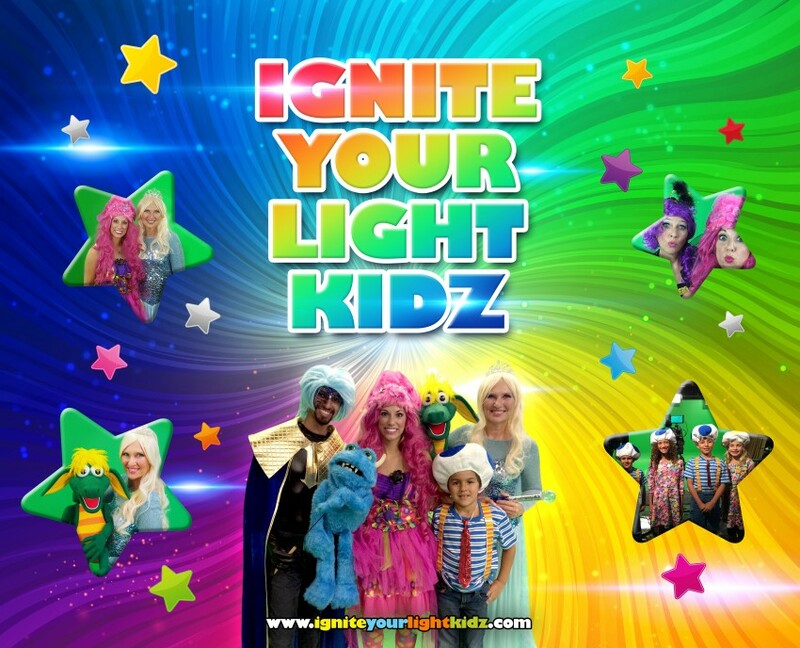 It's called Ignite Your Light Kidz, a Children's Christian Musical, and was created, written, and produced by Whitney Lynn. We are currently on tour and taking more bookings for our stage production of skits, singing and comedy. Call, text, type, post, mail, like, tweet, watch, snap, pin, yell, holler....let's connect. Jacki Manna provides her own sound system. Jacki Manna's mentor was Howie Olson, a TV star on WISC-TV in Madison, Wisconsin on a children’s program called Circus 3. In Houston, Texas he had a radio and sponsored TV show called Phenix Phil. Howie was a well known and respected ventriloquist, magician, and figure maker who took Jacki on as his apprentice in 1989. Howie died in 1992 and left his magic and puppets to Jacki. One of the puppets was the famous Cowboy Eddie who was carved in 1910 by the Mack brothers, the same ones who carved Charlie McCarthy. Jacki was an invited performer at the 36th Annual Vent Haven convention in Kentucky in July 2012, where she paid tribute to Howie Olson by performing with his 102 year old puppet Cowboy Eddie. She and Eddie performed at the Houdini Convention in Madison, Wisconsin in 2013, at the Midwest's Premier magic convention AbrCORNdabra in 2014, at Circus World Reunion in 2015, and at the Florida StateMagic Convention Magicpalooza in 2016. Stage area 8' x 10' either elevated or main floor. Electrical outlet within 10 feet of stage.